A possible ceasefire between Israel and Hamas, the Islamist group that controls the Gaza Strip, is proving to be much more than an effort to end escalating violence that threatens to spark yet another Middle Eastern war. United Arab Emirates-backed Egyptian and United Nations efforts to mediate an agreement, with the two countries’ nemesis, Qatar, in the background, are about not only preventing months-long weekly protests along the line that divides Gaza and Israel and repeated rocket and kite-mounted incendiary device attacks on Israel that provoke Israeli military strikes in response from spinning out of control. They constitute yet another round in an Israeli-supported effort to politically, economically and militarily weaken Hamas and pave the road for a possible return to Palestine of Abu Dhabi-based former Palestinian security chief Mohmmed Dahlan as a future successor to ailing Palestine Authority President Mahmoud Abbas. Ironically, Israeli discussions with representatives of Qatar that has long supported Gaza constitute recognition of the utility of Qatar’s long-standing relations with Islamists and militants that the UAE, Saudi Arabia, Egypt and Bahrain cited as the reason for their 15-month-old diplomatic and economic boycott of the Gulf state. Israel and Egypt have agreed that Qatar would pay the salaries of tens of thousands of government employees in Gaza. Mr. Abbas has refused to pay the salaries as part of an Israeli-UAE-Saudi-backed effort to undermine Hamas’ control of Gaza and give the Palestine Authority a key role in its administration. In response to a request by Mr. Abbas, Israel, moreover, reduced electricity supplies, leaving Gazans with only 3-4 hours of power a day. Qatar has also been negotiating the return by Hamas of two Israeli nationals held captive as well as the remains of two Israeli soldiers killed in 2014 in Gaza. Mr. Abbas’ economic warfare was the latest tightening of the noose in a more than a decade-long Israeli-Egyptian effort to strangle Gaza economically. Included in the moves to negotiate a long-term Israeli-Hamas ceasefire are proposals for significant steps to ease the blockade. Mr Lieberman said he wanted to achieve that by “creating conditions in which the average resident of Gaza will take steps to replace the Hamas regime with a more pragmatic government” rather than through military force. Ironically, involving Qatar in the efforts to prevent Gaza from escalating out of hand gives it a foot in the door as the UAE seeks to put a Palestinian leader in place more attuned to Emirati and Saudi willingness to accommodate the Trump administration’s controversial efforts to negotiate an overall Israeli-Palestinian peace. Mr. Abbas, like Hamas has rejected US mediation following President Donald J. Trump’s recognition earlier this year of Jerusalem as Israel’s capital. Mr. Trump startled Israelis and Palestinians this week by saying that Israel would pay a "higher price" for his recognition of Jerusalem and that Palestinians would "get something very good" in return "because it's their turn next." Mr. Trump gave no indication of what he meant. The effort to negotiate a lasting ceasefire is the latest round in a so far failed UAE-Egyptian effort to return Mr. Dahlan to Palestine as part of a reconciliation between Hamas and Mr. Abbas’ Al Fatah movement. Mr. Dahlan frequently does UAE Crown Prince Mohammed bin Zayed’s bidding. US President George W. Bush described Mr. Dahlan during an internecine Palestinian power struggle in 2007 as “our boy.” Mr. Dahlan is believed to have close ties to Mr. Lieberman. Some 170 Palestinians have been killed by Israeli forces and 18,000 others wounded in Israel’s hard-handed response to the protests designed to prevent protesters from breeching the fence that divides Gaza from Israel. Ironically, Mr. Abbas may prove to be the loser as Israel and Hamas inch towards a ceasefire arrangement that could ultimately give Mr. Dahlan a role in administering the Gaza Strip. 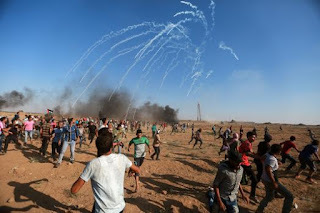 "Gaza has become a de facto state as it comprises a set area with a central body that governs the population, has an army and conducts foreign policy. So, in a way, countries have to be pragmatic and negotiate with Hamas. Israel's main interest is security—a period of complete calm in Gaza—and it is willing to do what is necessary to achieve this,” said Giora Eiland, former head of Israel's National Security Council. "Until recently, Cairo insisted that Abbas re-assume control over Gaza, which Hamas would not accept, specifically the call for it to disarm. Now, Egypt understands that this is not realistic and is only demanding that Hamas prevent (the Islamic State's affiliate) in the Sinai from smuggling in weaponry. The only party that is unhappy with this arrangement is Abbas. who has been left behind. But this is his problem,” Mr., Eiland added. A Hamas-Israel ceasefire and the possible return of Mr. Dahlan are likely to be but the first steps in a UAE-Egyptian-Israeli backed strategy to engineer the emergence of a Palestinian leadership more amenable to negotiating an end to the Israeli-Palestinian conflict in a geo-political environment that favours Israel. Whether Mr. Trump’s remark that Israel would have to pay a price for his recognition of Jerusalem was a shot from the hip or part of a broader strategy is hard to discern. The White House has since sought to roll back Mr. Trump’s remarks. With the jury still out Israelis, Palestinians and their regional allies have nonetheless been put on alert as they manoeuvre to ensure their place in whatever emerges from efforts to reengineer the political landscape.